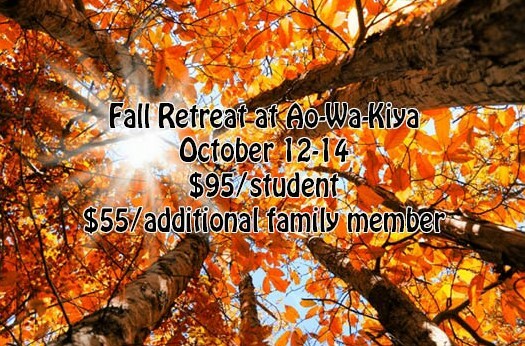 Fall Retreat will be October 12-14 at Camp AO-WA-KIYA. The cost is $95 per student and $55 for additional family members (Jr. or Sr. High). Money is due the Wednesday before retreat October 10. Each student also needs to have the South permission form filled out for the 2018-19 academic calendar year. In order to participate in the zip line and other camp run events students need to have the Ao-Wa-Kiya medical information filled out as well. Please DO NOT bring: electronics, including phones, ipods, gaming devices, etc. *Cameras are okay!